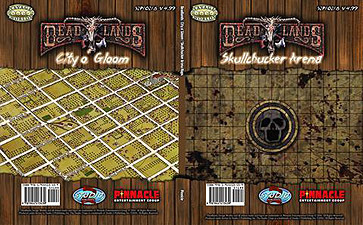 New for Good Intentions, this map has an arena for the Weird West's favourite sport, skullchucker, on one side, and a section of the City o' Gloom on the other! The skullchucker arena map is sized for combat with one-inch grid lines. This map has a coating that is wet, dry, and permanent marker erasable. It measures 24" x 30".